A controversial policy that's provoked the ire of Republicans is set to go into effect today in Travis County. Here's what you need to know about the latest sanctuary city fight. Analysis: Texas, a legislative sideshow to the main act in D.C. The Texas Legislature is primed to go, but this is going to be a session outside the limelight. The Texans are busy, but the spotlight is on the new administration in Washington, D.C.
At least two Texas Democrats and one Republican are pushing to reform the death penalty under the law of parties, which holds those involved in a murder equally responsible, even if they weren't directly involved in the actual killing. Parents brought their special needs children to a Senate hearing room to ask lawmakers to stop cutting services for their kids. Two days before death row inmate John Ramirez was scheduled to be executed, a federal district court in Corpus Christi halted the execution. A day before voting on changes to science standards, the State Board of Education heard from a line of scientists urging removal of language they say challenges evolution — and a handful of those in opposition. 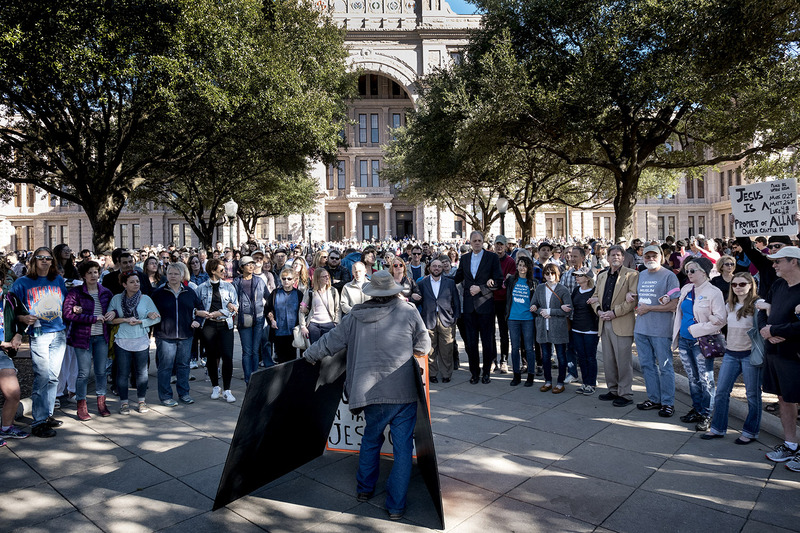 Participants in Tuesday's Texas Muslim Capitol Day were protected by a massive human circle made up of at least 1,000 supporters. Border Patrol Agent Joel Luna was found guilty of engaging in organized criminal activity, but a Cameron County jury acquitted him of murder. Newly-elected Travis County Sheriff Sally Hernandez is maintaining a campaign promise. Hernandez's office announced earlier this year it would stop holding inmates flagged by federal immigration enforcement for potential deportation. What is a sanctuary city? There's no official definition, but the term generally applies to cities that prohibit or limit local law enforcement from working with U.S. Immigration and Customs Enforcement (ICE) to detain immigrants flagged by the federal agency. Gov. Greg Abbott has taken a hard line on the issue. 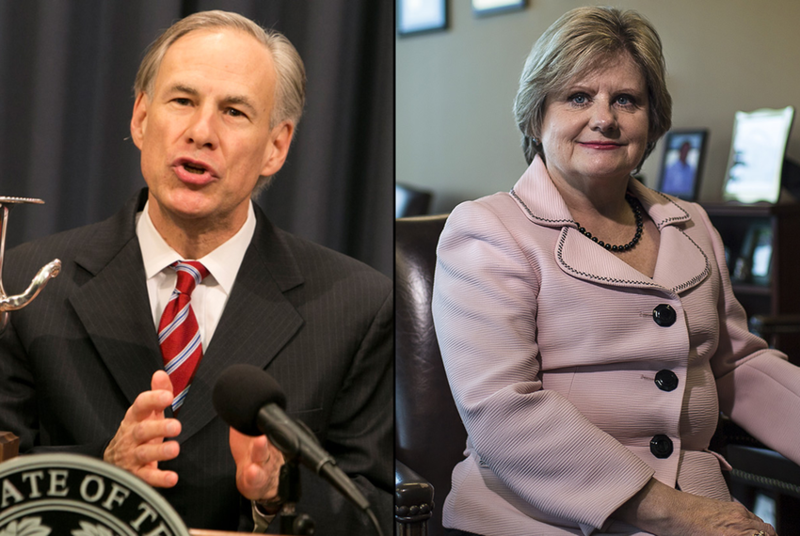 In addition to threatening to revoke state funding, Abbott has suggested officials who promote sanctuary cities should be removed from office. He also made banning sanctuary cities an emergency item this legislative session. The Senate Committee on State Affairs will take up state Sen. Van Taylor's ethics reform package this morning, another item Gov. Abbott declared an emergency item. Follow Texas Tribune reporter Jay Root for updates. The House convenes at 10 a.m. and the Senate meets at 10:30 a.m. You can watch the broadcasts live on our site here. If you know someone affected by Trump's refugee ban in Texas, we want to talk to you. Join the engineers who keep our site buzzing! We're hiring a software developer. Apply here. The Texas Tribune is holding a conversation with former U.S. Senate majority leader Bill Frist at 8 a.m. today at The Austin Club. Watch live here. For a complete list of upcoming events, visit our site. Supporters form a human chain around people participating in Texas Muslim Day at the Capitol. Photo by Laura Skelding. See more photos on our Instagram account. "School choice is not about advocating for one form of education over another. It is not about choosing private over public. Rather, school choice is about empowering parents with access to the best educational setting for their child — no matter where they live or how much money they make."